In the 1995 crime comedy Get Shorty John Travolta plays Chili Palmer, a cheap hood with a secret life as a chronic film buff. We see him sitting in Santa Monica's Aero Theater, rudely rhapsodizing over the conclusion of Touch of Evil. Judging by Chili Palmer's ecstatic reaction to the noir classic, one would never think that, for its director, Touch of Evil was a major career disaster. Orson Welles' American directing career lasted only seventeen years. His final film for a Hollywood studio was a work-for-hire job obtained through the intervention of actor Charlton Heston. Welles directed brilliantly but lost control of his production in the editorial stage, and film historians have been studying the results ever since. Universal's new Touch of Evil DVD set duplicates the video contents of an exhaustive 2008 50th Anniversary Edition DVD set, with three separate versions of this superb noir thriller. We can read Welles' notes, compare them to the studio's cuts and debate the restoration decisions made by the Hollywood experts. 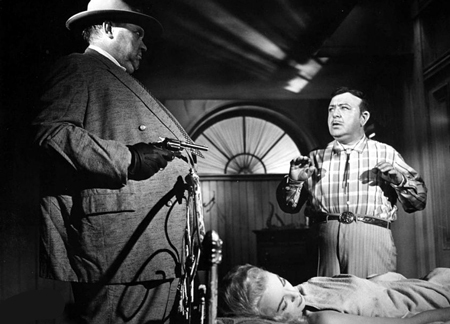 Although Universal practically threw it away, Touch of Evil was soon hailed as one of the director's top masterpieces. The new disc set unravels the mystery of its three distinct versions. The theatrical version (96 min.) is what played a few weeks on a double bill in 1958. The longer preview version (109 min.) was for many years presumed to be Orson Welles' preferred cut. When associate professor Bob Epstein screened this version for us at UCLA in 1972, he told us that it had never been seen outside the studio. The third cut of Touch of Evil is the well-publicized 1998 restored version (111 min) edited by Walter Murch, which attempts to return the film to a form closer to Welles' intentions. The DVD reprints the director's painfully worded memo, in which he pleads for the studio to limit their butchering of his labor of love: "I must ask that you open your mind for a moment to this opinion from the man who, after all, made the picture." All of Welles' Hollywood pictures after Citizen Kane suffered serious studio interference. Most fans know about the wholesale trashing of The Magnificent Ambersons, which by all accounts may have been an even greater achievement than Kane. Welles' The Stranger lost a long prologue about O.S.S. agents tracking a Nazi zealot through South America. The ambitious thriller The Lady from Shanghai was given the full treatment. Columbia dictated re-shoots and nixed the director's interesting soundtrack ideas. The quality common to of all of these films is directorial brilliance; it now seems insane that any film studio would interfere with any of them. 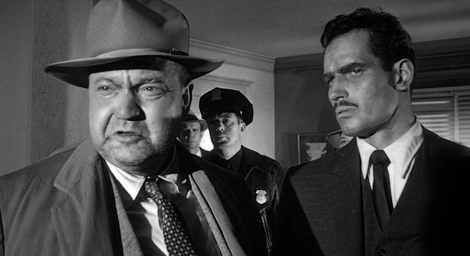 Touch of Evil is an examination of corruption in a seedy border town. A bomb blows up an American millionaire, forcing Mexican vice detective Miguel Vargas (Charlton Heston) to investigate. American police chief Hank Quinlan (Orson Welles) proceeds to frame the most likely suspect. Meanwhile, Miguel's new bride Susie (Janet Leigh) is terrorized by the Mexican Grandi mob. Uncle Joe Grandi (Akim Tamiroff) hopes to frighten Vargas into calling off an investigation into his family's criminal activities. Coming at the tail end of the classic film noir era, Touch of Evil transcends the noir style with a generous use of distorting lenses, swooping cranes, eccentric blocking and intricate tracking shots. Half the movie is clipped montage and the other half gliding camera moves. The film contains three of Welles' most impressive cinematic set pieces. A long scene in Joanna Moore's apartment sustains our interest for several minutes without a cut -- and without letting our attention wander to thoughts of technique for its own sake. Welles packs his film with a gallery of grotesques --Tamiroff's literally greasy gangster, Dennis Weaver's nervous motel keeper, Mercedes McCambridge's butch drug pusher. Janet Leigh provides a "touch of normalcy" as the rather naïve Philadelphia wife of a Mexican vice cop. Charlton Heston's unusual casting has never been accepted by people who think that all Mexicans must look and sound like Gonzales-Gonzales. Orson Welles often chose classical adaptations for his personal projects, but genre thrillers account for some of his most interesting work. For this adaptation of a lower-case crime novel he plays up racial tensions and carries the Bad Cop theme to new heights. Quinlan's habit of framing suspects isn't excused by the fact that his hunches are invariably correct, and Vargas makes a good distinction between the Rule of Law and a Police State. The movie also belies the notion of Welles as an egoist. Most of the quality material goes to a cast of fine actors seldom given much of a chance elsewhere. Ray Collins is a District Attorney badgered by Welles' police captain. Joseph Calleia's doggedly loyal sidekick Menzies is the most affecting character in the movie. Akim Tamiroff is both the film's main menace and its comic relief. Joseph Cotton appears as an unbilled guest star, as does Zsa Zsa Gabor. But Welles' personal style won few friends in the studio system. He was considered a showoff, a pain in the neck guaranteed to make any studio executive look like a fool. Welles tended to ignore production schedules and didn't get along with staff editors. The studio learned that Marlene Dietrich had been added to the cast only when her face showed up in dailies, leaving them in a poor position to negotiate for her services. Universal's opportunity to fire the maverick genius came when the director foolishly (suicidally, one would think) absented himself from the studio to raise money for a personal production, Don Quixote. Charlton Heston reports that Welles simply took off and remained unreachable by phone. The studio lost no time ordering re-shoots and a full re-cut. When Welles saw the preview version, he wrote his famous 58-page memo, a pitiful attempt to undo the damage. The memo's pleading about audio montages and fine points of narrative most likely fell on deaf ears. In no way would the studio once again place itself at Welles' creative mercy. The preview version begins with a misleading title saying that it has been modified from the theatrical version, when the reverse is true. It carries a commentary by critics Jonathan Rosenbaum and James Naremore. Both have written books on Welles and Rosenbaum served as an advisor on the 1998 restoration. They point out scenes excised for the theatrical cut, and re-shoot material directed by Harry Keller. The standard theatrical cut honors a few of the suggestions in Welles' famous memo, but slashes the film by twelve minutes, obscuring a number of important story points. F.X. Feeney's commentary for this cut provides an excellent filmic analysis, making an interesting case for Touch of Evil as a major influence on Alfred Hitchcock's Psycho. The 1998 restored version carries two commentaries. 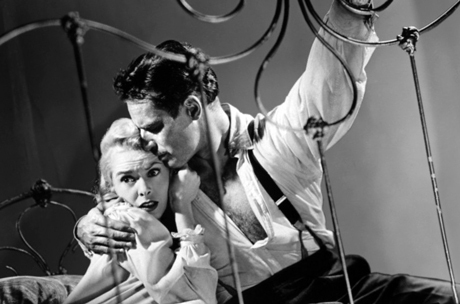 Restoration producer Rick Schmidlin shares a commentary with the late stars Charlton Heston and Janet Leigh, and returns on a solo track to tell the story of his years-long effort to re-cut Touch of Evil. Schmidlin makes a good case for editorial choices applied to the 1998 revision. He has a producer's tendency to name-drop, but convinces us that he did his homework. He mentions UCLA professor Bob Epstein's discovery of the preview cut, assigning credit where due. Schmidlin also did some expert snooping, locating a box of invaluable Welles notes kept by Universal's head of post-production. Walter Murch was impressed to learn that the 'perspectivized' audio re-recording tricks he invented for American Graffiti were in use by Orson Welles 14 years before, on Touch of Evil. The restored version's mission was to follow as many of Welles' memo requests as possible without doing damage to the great director's legacy. Rick Schmidlin had access only to material in the preview and theatrical versions, as all trims and outs had long been destroyed. But many of the most important changes involved relatively simple trims and scene shuffling. Schmidlin points to a scene juncture that, after being restored to Welles' cutting plan, now results in a much clearer continuity. Schmidlin and Murch almost kept a single close-up of Joseph Calleia, that Welles had asked to be removed. When they took it out, they discovered an improvement in the character tension in the film's climax. Universal scored the picture with cues by Henry Mancini. Luckily, split audio tracks still existed for the theatrical version, allowing director-editor-soundtrack specialist Walter Murch to layer a sound design along the lines of the one described in the famous 58-page memo. Welles had wanted a picture in which bits of music would be heard only when their source was indicated on screen; car radios, live musicians, phonograph records. The disc set's commentaries want to convince us that the 1998 version does restore Touch of Evil closer to Orson Welles' original intentions. Universal's Limited Edition Blu-ray + Digital HD of Touch of Evil is an almost exact duplicate of the contents of the multi-disc DVD set from 2008 ... but there's a big difference. The added resolution and broader contrast range really makes the image pop; this is the first time I've seen Welles' movie look this good since Bob Epstein and UCLA. Fortunately enough, Universal has ignored the flat-earth, TV aspect ratio web lobby and left all three versions of the show at their proper 1:85 screen shape. Even Rick Schmidlin on the extras reminds fans that Universal protected the full frame only for future TV use. The four commentary tracks are engaging but less dedicated types may prefer the disc set's two interview featurette docus. I rewatched the making-of piece for the original film Bringing Evil to Life and was thoroughly entertained. Stars Heston and Leigh explain how Orson lost control of the picture. The second featurette Evil Lost and Found is a study of the 1998 revision, in which director Curtis Hanson takes us on a tour of the film's locations in Venice, California. Orson Welles 58 pages of notes are presented in a pamphlet form this time. Personally, I still like the Preview Version most of all. I don't feel that the 1998 revision could possibly reflect anything that Welles would come up with. In the editing room he may have found that he hated many of his original ideas, and invented 58 more pages of new inspirations. The revised Touch of Evil also doesn't sound anything like a 1958 film. I can't imagine Welles doing anything that's quite that dense. Bottom line, it's a shame that a creative juggernaut as brilliant as Welles was hobbled by the realities of commercial filmmaking. We have to be grateful for Touch of Evil in any form. 1. The main titles also help to obscure an odd moment in the border crossing scene. Vargas and Suzie check in at the U.S. side of the crossing, at the same time that the white convertible crosses back as well. Vargas talks about arresting one of the Grandi brothers, and then they walk back towards Mexico. He and Suzie then appear walking forward again a few lanes over. Their motions seem 'cheated' to slow them up so the convertible can get ahead, and to facilitate the camera crane catching up with them just as they kiss.